One of the biggest current buzzwords in the data security and cryptocurrency industries is blockchain, a recent technology that’s revolutionizing how transactions are tracked online. Instead of recording transaction data in a traditional database, blockchain decentralizes that data and ensures that no central authority can take complete control of any kind of online transaction (financial or otherwise). It may sound formidably technical, but at its core blockchain is a way for digital information to be stored and distributed, but not copied—blockchain is the digital infrastructure behind bitcoin. But although many of blockchain’s innovations have been centered around finance and cryptocurrency, it has the potential to majorly disrupt a variety of other industries, including digital marketing. The technology is also sometimes described as a shared spreadsheet maintained simultaneously across thousands or millions of computers, with no centralized authority. 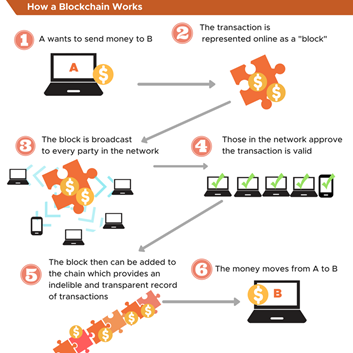 For this reason, blockchain is often referred to as a “peer-to-peer network” of transaction data; the blockchain is like one shared document, which has blocks of identical information shared across its network so it can’t be controlled by any one person. How can blockchain impact digital marketing? Targeted advertising has been an age-old problem for digital marketers. Even the most brilliant ad campaign is ineffective when aimed at the wrong consumer, and many consumers are so annoyed by the influx of irrelevant advertising that they begin to lose trust in the company selling the product. With blockchain technology, organizations can compensate consumers for use of their data in targeted advertising. Marketers are able to target specific groups of customers, and only display ads if those customers have specifically opted in to viewing advertisements related to a given product or subject. The company can then offer exclusive discounts for customers who view their advertising content. It’s a win-win: the customer gets compensated for viewing relevant advertisements, and the company can bolster both their marketing datasets and their customer trust, while ensuring that their painstakingly-crafted ad campaign reaches an interested audience. Search Engine Optimization algorithms measure, among other factors, the quantity and quality of inbound traffic to your site. When marketers set up an ad campaign using blockchain technology, they will not only drive more traffic to their landing pages (because the ads will be specifically targeted to customers with stated interest in the product) but can also guarantee the authenticity of that inbound traffic. Companies using a tokenized marketing strategy will be able to track consumer activity across their entire site on an individual level, and compensate those individuals for their activity. Blockchain can also impact the ads website owners choose to display on their site. Currently, many website owners might display Google banner ads instead of organically finding advertisers, because Google is seen as trustworthy and pays the website owners fairly for each click. Google Display Network, which vets the ads, is more or less a middleman who takes a cut of the profits from the website owner. Blockchain disrupts this traditional digital advertising model by allowing advertisers to buy and sell to the user directly. For instance, the browser application Brave uses the “Basic Attention Token” to allow advertisers to pay people directly for viewing their ad–the amount paid is based on the “mental effort” expended by the viewer. This new advertising system is both a more efficient use of ad funds by the company, and makes for a more interesting and relevant experience for the customer. One of the biggest problems for many companies (especially big ones), is consumer trust—especially with larger companies, consumers have no way of knowing whether the products for sale were produced ethically and responsibly. The key aspects of blockchain—decentralization and transparency—assures customers that no secrets are being kept, and everything is documented, verified, and accessible to the consumer. A great example of this trust-building transparency is Walmart’s partnership with IBM to make their supply chain process more transparent. Using blockchain technology, Walmart digitally traced their pork products, starting at the supplier’s base in China and ending on the shelf. Since they had full access to this tracking data, Walmart consumers could feel confident in the safety of the product. Plus, blockchain gives the consumer control of their own information. Instead of worrying that a giant corporation can access and manipulate their personal data, consumers will actually be able to charge micropayments for the use of that data. And the benefits aren’t exclusive to the consumer: when customers have the ability to buy and sell their own information, the quality of leads for companies will skyrocket. Of course, as with any disruptive new technology, the far-reaching impacts of blockchain are still developing. But in a world where data security and consumer trust are some of the biggest hurdles for marketers and customers, blockchain could one of the most important ways to boost sales and generate a stronger customer base. ZAG FIRST brings digital marketing expertise and bandwidth to help your business thrive. For more information on ZAG FIRST Digital Marketing, contact us.